OUR 2018 CUSTOMER SATISFACTION SURVEY IS NOW OPEN! We’re wrapping up our mummies and sending our zombies back to their graves…for now. That means it’s time for our annual customer satisfaction survey. 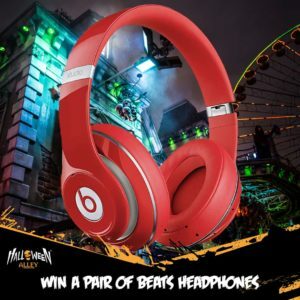 You just need to answer 3 quick questions for your chance to win a pair of Beats headphones. It’ll take you less than 5 minutes and your feedback will help us make 2019 even spookier! Did you visit one of our clearance centres? Were you laughing at our Halloween memes on Instagram? Was our decoration contest the highlight of your year? Or maybe you were hoping for more inflatable costumes and a wider variety of special FX makeup? Whatever your thoughts are, we want to know! Your feedback will help us make your next Halloween terrifically terrifying! After you’ve hung up your cape and cleared away all the cobwebs, fill out our quick 1-minute survey. After a few clicks, you’ll be entered to win this incredible prize. Listen to your favourite Halloween tunes with these spooktacular premium headphones. OR, wrap them up and give them as a Christmas gift! Actually, on second thought…They’re too good to give away, keep them for yourself! So what are you waiting for? Take the customer satisfaction survey now! One entry per person. Full terms and conditions can be found here.